Marvel at the breathtaking Andaman Sea on board our SY NAKAMAL. You may choose between daily excursions or overnight cruises. Experience the tropical realms of the crystal clear waters with opportunity to visit Phi Phi Island, Krabi, Jame Bond Island and secluded Tarutao Archipelago. There are many more destinations that can be explored all in combination with fishing, snorkeling, trekking or just by relaxing in the sun. The itinerary is up to you! Experience our cruises today. Our multi lingual crew will ensure your safety and enjoyment along with memories of a life time! Discover the most beautiful places in the Andaman Sea around Phuket Island up to the Andaman Islands and experience a holiday of a lifetime on our sailing catamaran that you'll never forget. We promise unique adventure sailing cruises in comfort. Our trips are fun, exciting and provide our guests with freedom to go where they want. We have a "hands on approach" which means everyone is part of the crew by helping to sail the boat. If you don't want to help hoisting sails, no problem. But if you would like to learn about sailing from our experienced Captain, he will be more than happy to teach you the "ropes". As experienced sailor you will have the freedom to sail the boat as much as you would like. Experience places most people will never see! 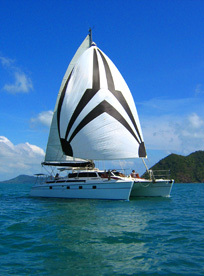 It doesn't matter how big or small your group is, if you want 1 day of local sailing, a romantic sun set cruise, or many weeks of adventure sailing exploring the numerous islands in this region, just let us know what you want and we will be happy to organize everything for you, from the very moment your plane lands in Phuket until you'll leave.